It started with an article in the German journal for physiotherapy in August 2002: Physiotherapists were sought to help the little three year old girl Rigzin struck with cerebral palsy with professional care. Karola Wood and her husband have always wanted to visit the Himalaya and go hiking. Karola is a physiotherapist working in a neurological clinic. They had many years of mountain experience, so they applied for the job. They meticulously prepared one long year for the operation. Their friends wanted a part in this work so they urged them to found an official registered non-profit organisation. Gratefully Mrs. Wood took to this help and a warm Sunday in June 2003 birthed the Ladakh-Hilfe e.V. 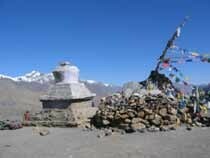 (Ladakh-Help), the base for all operations now. Toward the end of August they started their five week journey to Ladakh, North India, a country in the western Himalaya. With them they carried many aids for the poor mountain people: children's shoes, clothes, medication, useful gifts, food, toys and therapeutical aids for the treatment of the little Rigzin. For the couple it turned into a journey into medieval ages. They met the friendliest people on earth, encountered the Buddhist religion everywhere and fell in love with the country of high passes, its culture and it's inhabitants. Saying good bye was difficult, especially leaving Rigzin behind. They had grown very close by then. Rigzin lived with her mother, her healthy older sister and the grandmother in extreme poverty in a small village only to be reached by a four day trek. Because of the therapeutical success with the Lingshed girl other parents brought their children and asked for help. Karola Wood promised to do so. Contact with the "Namgyal Institute for the Handicapped", the only organisation caring for the disabled back then in Ladakh was established. Back in Germany they tried to adjust to "normal" life and started to create a chain of events: Karola wrote newspaper articles, held many slide-presentations and a radio interview to spread information. She organised Physiotherapists willing to continue their work in Ladakh. In February 2004 an e-mail from Cynthia Hunt reached them: Another severely handicapped child had been found in a remote village. She had been hidden by her parents for 17 years because they were ashamed. Would they please come and help this girl? They immediately said yes and their friends supported them. With lots of public relation activities the finances for the new trip was generated, and they even won money in a lottery, enough to support the trip. So it happened that June/July 2004 found them back in Ladakh. Only nine months had passed since they left the country. The parents came from everywhere bringing their disabled children with the plea for help. The couple made contact with the many NGOs and organisations who were able to link up with the vision and started to help. A book with many explaining pictures for parents with disabled children was printed by Cynthia Hunt. "Give the hungry a fish and you save him from death today. Teach him to catch fish! He and his family will be taken care off the rest of their lives." Working with the people in the remote areas requires a lot of patience and sensibility. To try to apply western standard will cause frustrations and problems. The last years they had been confronted with many new things out of the west, new ideologies and they are very confused. Their wonderful ecological structures are endangered. Those very practical people will be able to move a lot themselves in behalf of the handicapped with a little help. To describe the totally different situation of the mountain people we will use Rigzin's problem: She is three years at this time and still small enough to be carried on her mothers back. She cannot walk or sit on her own. On her mom's back she still gets around the very steep mountain village, meets people and get stimulated and trained this way. But soon she will be to big and heavy to be carried. In Germany one would think about proving the child with a wheelchair, basically a good idea. But it is impossible to push a wheelchair around in the mountains with all those rocks! But a little donkey with a special saddle to hold the child may move up and down those steep slopes. The craftspeople in Lingshed were able to make such a saddle. As a matter of fact, a donkey only cost about 60 $ and a saddle about the same. This aid is still much cheaper than a wheel chair in Germany. The animal may also be used for fieldwork by the family and this pays for his own fodder. 1.With the RAC, the REWA Ability Center, the home for the handicapped in Leh and Kargil, the parents have a place that helps them. During the winter months the parents may come to the Centre and be thought and their children can be treated properly. Prejudice and superstition is being substituted with healthy and practical thinking. The daily life situation of the family is being changed to integrate the child more. From Germany will we do everything to support the Centre in any way possible: By sending volunteer teachers and instructors, teaching material, shipment of aids for children, financial help. 2. During the first years locals had been educated by our German physiotherapists, local doctors and medical trained personal to become so called "physio-aids". They had gained a solid theoretical and practical knowledge about the subject. But in the last years we have send most of the staff for professional training to Delhi. The staff knows their own, speaks their language, visits the villages and the special children, treats them and teaches the parents to handle their children and try to integrate the entire family and the village in the therapy. Selected professional volunteers from all over the world still comes to aid the staff with teaching and supervision. 3. Educational material had been printed, informative flyers about the work of REWA are being distributed. In Kargil there is an effort to produce informative written material in several local languages at the moment. 4. We will continue to help Rigzin-Stanzins family and try to find ways together with them to establish means of living for a life away from the sting of poverty. Stanzins mother now lives in Leh with her family and works for REWA. We want to encourage you to browse through the pages of our website. Escape into a world so different to ours and allow you to look through the treasure of information to discover many hidden secrets of which some of them may be unbelievable, yes, even close to a miracle. This story is a story of miracles and human compassion. Maybe you also get infected by this virus; it has infected so many of us. Within you it causes enthusiasm and dedication for this land and its people and will enrich our own life immensely. It will be fun to work for and support those wonderful people of Ladakh. 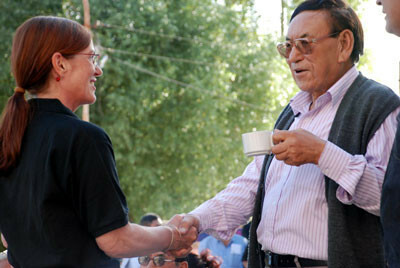 Karola Wood, Director of Ladakh-Hilfe e.V.